The National Gallery of Art was created in 1937. Through the generosity of Andrew W. Mellon, a financier who was also a public servant, the Museum gained its first collection. Mellon had a passion for art and his large collection of old master paintings, sculpture and other works were intended for all of America to enjoy. After his death, Congress accepted his collection and thus the National Gallery was born. Whether you’re an experienced art connoisseur or you just enjoy strolling through museums, you should stop by the National Gallery of Art while on vacation in Washington DC. One of the world’s premiere museums, the Gallery has more than 140,000 pieces that include paintings, sculptures and decorative arts as well as drawings, prints and photographs. Exhibits span the history of Western art from the Middle Ages up to the present time. Unique pieces in the extensive collection include self-portraits by Rembrandt and van Gogh. Pittsburgh banker and later Secretary of the Treasury, Andrew Mellon played an instrumental role in the museums creation. In addition to his extensive private collection, Mellon worked to amass items for a new national art museum during the 1920s. Major acquisitions included Raphael’s Alba Madonna and other pieces from the Hermitage Museum in Russia. Mellon offered to donate the collection, contribute funds to construct a building and endow a museum to preserve and display the collection. An Act of Congress established the National Gallery of Art and its adjacent Sculpture Garden in 1937. The original museum, now known as the West Building, was designed by architect John Russell Pope, who also designed the Jefferson Memorial. The Neoclassical-style building is made from pink Tennessee marble and features a dome rotunda modeled after the interior of the Pantheon in Rome. Wings off the rotunda boast sky-lit exhibition halls. Completed in 1941, the building occupies the site of the former Baltimore and Potomac Railroad Station where disgruntled office seeker Charles Guiteau assassinated President James Garfield in 1881. Neither Pope nor Mellon lived to see President Franklin Roosevelt open the museum in 1941 because they died four years earlier. As Mellon had anticipated, the opening of the Gallery encouraged other patrons of the arts to donate all or portions of their collections for the benefit of the public. Founding benefactors include Samuel Kress, Ailsa Mellon Bruce and Lessing Rosenwald. The East Building was completed in 1978. The work of famed architect I. M. Pei, the award-winning building features dramatic geometric designs, including trapezoidal and triangular shapes. The high atrium with its open court is the building’s most striking characteristic. Mellon’s children, Paul and Ailsa, funded the construction. The final element of the Gallery was completed with the addition of the Sculpture Garden 21 years later. Not part of the Smithsonian Institution, the museum is operated as a public-private partnership. The federal government allocates funds for the museum’s operations while art pieces are acquired by donation or with private funds. In addition to its special exhibitions that include traveling collections from other art museums located around the world, the Gallery is also home to three distinct areas. Once the largest marble building in the world, the West Building houses the museum’s collection of old masters and historic works. Paintings and sculptures by European masters from medieval times through the late 19th century fill the galleries. There are impressive works by pre-20th century American artists as well. Highlights of this portion of the Gallery’s collection include pieces by Vermeer, Monet and da Vinci. In contrast, the East Building highlights the Gallery’s collection of modern and contemporary pieces. The building is also home to the Center for Advanced Study in the Visual Arts, a research and educational facility. Pieces on display in the East Building include works by Picasso and Matisse as well as Alexander Calder, Jackson Pollack and Andy Warhol. Recent special exhibitions featured Barnett Newman’s series entitled “The Stations of the Cross,” “Three Centuries of American Prints” and “Bronze Sculptures of the Hellenistic World.” In addition, a display commemorated the “Monuments Men” who helped protect priceless works at the end of World War II. Their exploits were also depicted in a 2014 movie by the same name. After 30 years of planning, the Sculpture Garden opened in 1999. Designed by landscape architect Laurie Olin, the garden features American species of canopy and flowering trees, ornamental shrubs, ground cover and colorful perennials. A reflecting pool and fountain adorn the center of the garden. Arching pathways are lined with modern, colossal sculptures by a variety of artists, including Roy Lichtenstein and Louise Bourgeois. Located on the National Mall, the Gallery and Sculpture Garden span Constitution Avenue, NW from Third to Ninth Streets. The museum is open Monday through Saturday from 10 a.m. to 5 p.m. and Sunday from 11 a.m. to 6 p.m. The Gallery is closed on Christmas and New Year’s Day. The East and West Buildings each have a public entrance and are connected by an underground moving sidewalk. Admission is free of charge. Parking near the Gallery is limited. The closest Metro stops are Archives-Penn Quarter-Navy Memorial on the Yellow/Green Lines, Judiciary Square on the Red Line and the Smithsonian Stop on the Blue/Orange Lines. There are also several nearby Metro bus stops. Visit the Washington Metropolitan Area Transit Authority website for current schedules. There are several free, docent-led, self-guided and audio tours available. For those looking to grab a bite to eat between collections, there are four on-site cafes offering a variety of espressos, gelatos, soups and sandwiches. And for travelers visiting in the summer, the Gallery sponsors outdoor concerts in the West Garden Courtyard and the National Gallery of Art Sculpture Garden. Located just to the west of the Gallery, the Smithsonian Museum of Natural History features a collection of more than 126 million artifacts, including the Hope Diamond. 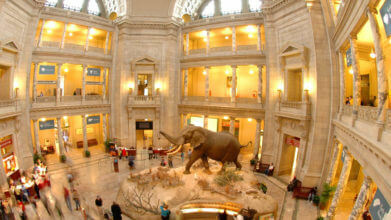 Famous for its Dinosaur Room, it is the third most visited museum in the world. Housing the Declaration of Independence, the Constitution and the Bill of Rights, the National Archives is the repository for many of the nation’s most important documents. Other key items in the archives include the Emancipation Proclamation, the Louisiana Purchase Treaty and an original version of the Magna Carta from 1297. Containing the Wright Brothers’ 1903 Flyer, Charles Lindbergh’s Spirit of St. Louis and an actual moon rock, the Smithsonian Air and Space Museum chronicles the history of manned flight and space exploration. The museum also has a flight simulator, a planetarium and an IMAX theater. Situated at the eastern end of the National Mall, the U.S. Capitol Building is one of the most magnificent buildings in Washington, DC. A symbol of American democracy, the building is open for public tours and allows visitors to witness government in action. You’ll gain insight into the legislative process and learn the history of key political figures.